Shoe liners are great for keeping you cool, and for that trendy sockless look too, but step up to bamboo, and you’re literally going to feel the benefits. Our men’s SockShop Plain Bamboo Shoe Liner Socks are the natural choice to keep your feet dry, fresh and comfortable, creating the ideal environment for healthy skin. These low cut ‘invisible’ socks sit below the line of shoes, while putting that essential barrier between you and your footwear. Bamboo naturally absorbs more moisture than comparable cotton, is gentler to skin and is totally antibacterial, so odour is kept at bay for longer. 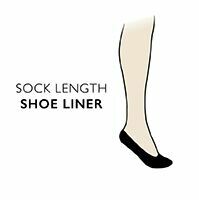 Supplied in a twin-pack, SockShop Plain Bamboo Shoe Liner Socks have slip-resisting silicone grips in the heels to stop your liners from sliding underfoot during wear.